The blue blossom ceanothus (Ceanothus thyrsiflorus) is an evergreen shrub that is native to California. The blue or white blossoms will attract butterflies and birds. The botanical name is Ceanothus thyrsiflorus. It is in the Rhamnaceae (Buckthorn) family. Relatives include the buckthorns (Rhamnus spp.) and the jujube (Ziziphus jujuba). This species is an endemic shrub of California and can grow in Zones 7-9. At maturity, Ceanothus thyrsiflorus will usually be up to 12' tall and wide depending on the variety, though under ideal conditions it may be over 20' tall. Blue blossom ceanothus should be planted where it will receive full sun for best growth. Look for the three veins that run along each ovate leaf of the blue blossom ceanothus. The light blue flowers form in clusters called panicles. They become dark brown capsules after fertilization. 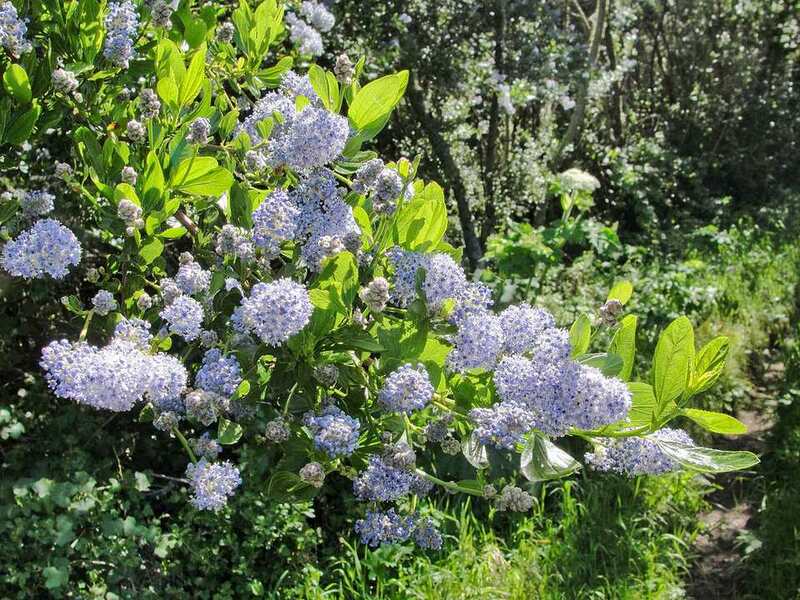 The blue blossom ceanothus is favored by birds, butterflies, and hummingbirds. If you would like a dwarf variety, look for 'Repens' or 'Blue Mound.' For white flowers, choose 'Snow Flurry.' Another cultivar of note is 'Skylark,' which won the Award of Garden Merit from the Royal Horticultural Society. There are not too many problems associated with Ceanothus thyrsiflorus. You may see aphids, scales, Phythopthora or honey fungus. Rabbits and deer may also chew on the plant.